For Wayne, success is letting veterans know their world has not ended with the diagnosis of PTSD. The author lives in Airdrie, Alberta, a commuter community that hasn’t lost its small town flavour, along with four lovely ladies—three of whom are puppies. 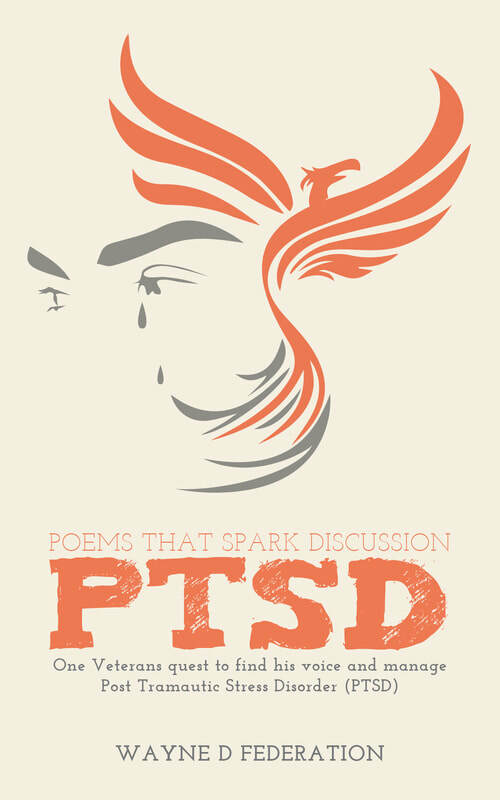 Poems That Spark Discussion is the story of one veteran’s quest to find his voice and manage post-traumatic stress disorder. A collection of poetry, it features thoughts about love, fear, suicide, drugs, anger and, most importantly, survival. For many, PTSD is considered a curse; for Wayne D. Federation, it was life saving. He spent decades thinking his anger, emotional numbness, fear, insomnia, aversion to noise and crowds, and other idiosyncrasies were normal. A diagnosis of PTSD in 2012 helped him understand that the behaviour was a result of his mind trying to make sense of what he’d witnessed and experienced. Wayne wrote this book to help himself cope with the realization that he was not okay. Once he began putting his thoughts on paper, it was like opening a channel to the world. Please leave an honest review on Amazon or below in the contact form - thanks for your support! I got to know Wayne during our retreat with the Veteran's Transition Network, where we got to share each others' stories about our lives as soldiers and police officers. We shared each others' vulnerabilities and regularly, Wayne would write a poem about that part of his pain, which quite often, was part of my pain, too. Wayne's wisdom and creativity has helped me appreciate that I am not alone with my struggles. We have ptsd together, brother. Your written words are far deeper than your spoken and I appreciate reading them." "I have had a chance to go through this and it is quite moving. You are truly blessed to have Dianne and your puppies and the horses with you on this journey. I must say that I experienced quite an array of emotions as I read it...."